Imagine having thick, dark, beautiful eyebrows from the moment you wake up in the morning until you go to bed - without ever having to apply makeup! Microblading is a modification of permanent (tattoo) makeup. 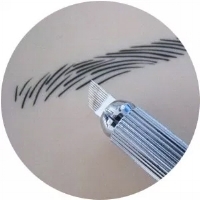 It uses a technique that is more superficial and creates much finer, hair-like strokes than traditional tattooing. Because the treatment is more superficial, and the ink is more easily broken down by the body, the treatment is only semi-permanent, lasting one to two years. Microblading is safe, if performed using proper sterile technique. As we are a medical Clinic supervised by Dr. Hegmann, we conform to medical standards of cleanliness. All tips and ink used are single-use and disposable. All other tools and surfaces are properly cleaned and sterilized following standard medical protocol. Before the treatment, we apply a topical numbing cream. This makes the treatment virtually painless. However, you may feel a slight pulling or scratching sensation. + What will I look like after the procedure? Immediately after the procedure, the treated skin will be red and may be a little swollen. Your eyebrows will appear much darker than normal, but will lighten 50-75% over the next two weeks as the area heals and some of the ink is released. **It is important to read and follow all aftercare instructions to ensure an optimal result. + How long does microblading last? Is it permanent? Microblading lasts, on average one to three years, depending on how quickly your body breaks down or releases the ink. After about one to two years, you may notice it is fading and you may want to come in for a touch up. + Will my eyebrows look worse when the microblading wears off? No. Your eyebrows will not look worse if you decide not to continue with microblading. Over time, the ink will fade and you may wish to return to our Clinic for a touch up. If not, your eyebrows will simply return to their previous appearance. + Will it look unnatural? This depends on the skill of the aesthetician. Our aesthetician has over ten years of experience in permanent makeup. She will take the time to consult with you, make recommendations, and draw the new shape on your face to make sure you are happy with it before any work is done. She will also stop periodically during the treatment to show you the results so far and make sure you are happy with them. When properly done, microblading will look completely natural and enhance your complexion and the shape of your face. People will notice how good you look, but nobody will be able to guess what you've done. The cost of microblading at our Clinic is $550.00. This price includes the initial consultation, the treatment, and a follow-up appointment 2 weeks after your treatment for a touch up, and to ensure you are happy with the results and have no further questions or concerns.